So there you are, relaxing in front of the television when that familiar Emergency Alert System sound starts blaring over the show you are watching. You think maybe it’s a regular system test or perhaps a severe weather warning, but no… it’s a Zombie Attack Alert! Unfortunately this is a true story. A zombie attack alert was issued on a handful of U.S. TV stations last month when hackers gained access to the EAS equipment. The most shocking part of this story is not the concerned calls from citizens who wanted to know if the zombie attack was real, it is the fact that the T.V. stations never changed the default password for their EAS equipment. Thankfully as a result of this incident, Broadcasters have received valuable security education and EAS equipment makers are looking for methods beyond password protection to ensure that this does not happen again. Just when you were starting to feel a sense of relief that the world didn’t end on May 21st, along comes a dire warning (albeit with tongue firmly in cheek) from the Center for Disease Control and Prevention. Assistant Surgeon General Ali Khan gives us a helpful “Better Safe than Sorry” plan for surviving a zombie apocalypse-style disaster scenario. Her witty approach makes a standard emergency preparedness plan suddenly seem exciting. 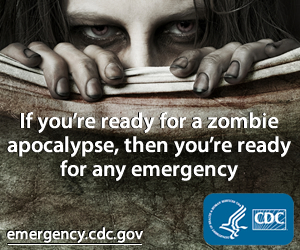 Using the recent rise of zombies in pop culture, the CDC can educate the public on how to prepare for an actual emergency that could occur. Thankfully, if zombies ever did show up, the CDC is ready.